 Time — When the network connection was first detected.  Inbound interface — The network interface the connection came in through.  Outbound interface — The network interface, if any, the connection is routed to.  Source IP — The IP address of where the connection originated from. If source NAT-ing was applied to this log entry, the IP address shown here is before the source NAT rule was applied.  Destination IP — The IP address, if any, of where the connection is routed to, taken from the packet header. If port forwarding was applied to this log entry, the IP address shown here is after the port forward rule was applied.  Protocol — The protocol and IP protocol number taken from packet header.  Source Port — The port number, if any, of where the connection originated from.  Destination Port — The port number, if any, of where the connection is routed to, taken from the packet header.  Rule — The firewall, Smoothwall access, port forward, or advanced networking rule this connection matched. Clicking the rule name brings you to the relevant configuration page.  Action — Whether this particular connection was accepted, dropped, or rejected. An entry of N/A is typically seen for audited traffic entries. Tip: The amount of Firewall log data retained by the Smoothwall depends on the Datastore's log retention settings — see Managing Datastore Log Retention. When first viewed, the Firewall log viewer has no filters applied. All columns can be used to filter the log data. 1. Go to Reports > Logs > Firewall. By default, the Firewall log viewer displays up to the last 100 entries from the previous two hours. b. Select the required date and time to filter from. A new section — Active filters — is now available before the log data table. 2. Additionally, you can filter by any column in the Firewall log viewer, even those you have selected to not show (see Changing the Displayed Columns). a. From the left filter (typically showing Inbound interface if a previous filter has not been applied), click the drop-down arrow and choose the relevant criterion. b. The neighboring field changes to accommodate the chosen criterion. Either select the relevant filter from the drop-down, or enter the required data. The Firewall log viewer immediately updates the view to take into account the filter. 3. Repeat steps 2 - 3 to add all required filters. 4. If a filter was mistakenly added, from the Active filters list click to remove the filter. 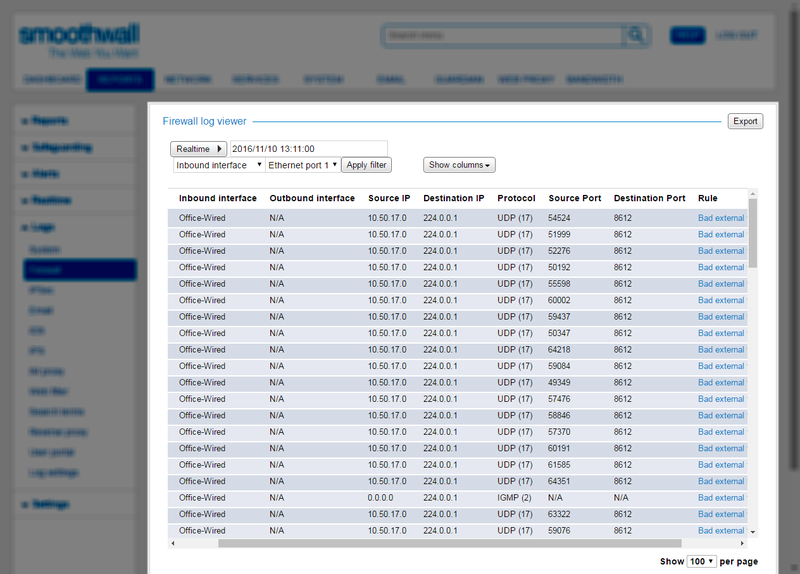 When first viewed, the Firewall log viewer shows all columns. You can change the view to show only required columns. 2. From the Show columns drop-down, clear the selection for those columns you don't want to see. The Firewall log viewer immediately removes the columns from view. 3. Use the Show columns to add columns to the viewer. You can change the Firewall log viewer view to show 10, 20, 50, 100, or 200 rows. 2. From the bottom of the page, change the Show # per page drop-down to the relevant value. The Firewall log viewer immediately updates the view. At the time of writing, only a tab-separated form (but exported with a CSV file extension) is supported. It should be noted that data is exported using UTF-8 character encoding. 2. Filter the log as required — see Filtering the Firewall Log Data. 3. From the Firewall log viewer heading, click Export. 4. Follow the browser-specific instructions for saving the created results.csv file to the required location.